For four innings last night, Jon Lester pitched like a man trying to make history as he held the Blue Jays without anything close to a hit. But he did not take the mound for the fifth inning, leaving with an injury that could change the course of the season for the Red Sox. 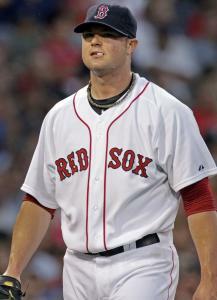 Lester has a strained lower left latissimus, a large muscle that runs beneath the shoulder. The lefthander does not believe the injury is serious but will undergo an extensive examination today. The injury overshadowed an exciting 3-2 victory for the Red Sox, which ended with a play at the plate as Jason Varitek took a throw from left fielder Darnell McDonald and tagged out Edwin Encarnacion. The Sox have won five of their last six. Lester wanted to go back to the mound in the fifth but head athletic trainer Mike Reinold ruled against it. Lester said he felt “sore [and] hurt’’ and that the discomfort did not subside once he came out of the game. But he is not worried about the injury being long term. If Lester were to go on the disabled list today, he would be eligible to return on July 22 and miss only five games after the break. Matt Albers, Franklin Morales, Daniel Bard, and Jonathan Papelbon finished the game for the Sox. Albers (3-3) was the winner with Papelbon picking up his 18th save despite allowing two runs on four hits in the ninth. The Sox took a two-hit shutout into the ninth. Papelbon allowed a single by Corey Patterson before Jose Bautista hit a towering blast to left field for his 28th home run. Encarnacion singled before J.P. Arencibia walked with two outs. Papelbon got ahead of John McDonald 0-and-2 before leaving a fastball up. McDonald slapped the ball to left. Darnell McDonald threw high to Varitek but he blocked the plate with his left leg and pulled the tag down on Encarnacion to end the game. Replays showed Encarnacion may have scored, but umpire Brian Knight called him out. “I pick up my teammates, some days they pick me up,’’ Papelbon said. Jays manager John Farrell didn’t quite see it that way. Lester is 10-4 with a 3.31 earned run average and his loss for even just a few weeks would be an obstacle. Alfredo Aceves already has been told he will pitch in Lester’s place on Sunday against Baltimore. The Sox may need to call up a relief pitcher from Pawtucket today after using their bullpen for 11 2/3 innings the last two nights. The Sox already have lost Daisuke Matsuzaka for the remainder of the season because of elbow surgery. Righthander Clay Buchholz, on the disabled list with a back injury, is seeing a specialist today. John Lackey is in the rotation despite a 7.47 ERA. Lester faced 13 batters and retired 12 of them. The only Blue Jay to reach against him was Arencibia, who walked on seven pitches in the third. Lester struck out five and allowed only one ball out of the infield. His performance ended after 50 pitches, 35 strikes. “I thought I threw the ball pretty well. It was probably the best fastball location and just pure stuff fastball I’ve had in a while. It’s a shame I had to waste it,’’ Lester said. The Sox lost the no-hit bid with two outs in the sixth when Bautista singled to left. The situation did not exactly captivate the crowd of 37,745 at Fenway Park as thousands did the wave during the inning. Brett Cecil (1-4) went the distance for Toronto, allowing seven hits. Varitek had an RBI double and J.D. Drew a run-scoring single in the second inning. Drew’s ball initially was called an error when second baseman Mike McCoy kicked it but later was changed by the official scorer. The lead grew to 3-0 in the third when Dustin Pedroia drove a fastball into the Monster Seats. It was his eight home run of the season. With Kevin Youkilis out, Pedroia hit cleanup. He has homered four times in six career starts as the cleanup hitter, twice this season. He also homered against Philadelphia while batting fourth last Thursday.